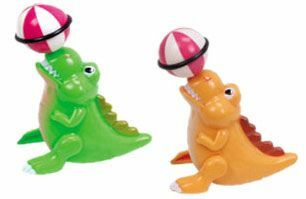 Upon winding these brightly coloured, clever clockwork crocodiles repeatedly flip up onto their tails and scoot forward while spinning the ball on their noses. They then drop down, whizz around in circles rapidly while continuing to spin the ball! Amazing multi functional clockwork mechanism! Colours vary. 8cm (3") tall.